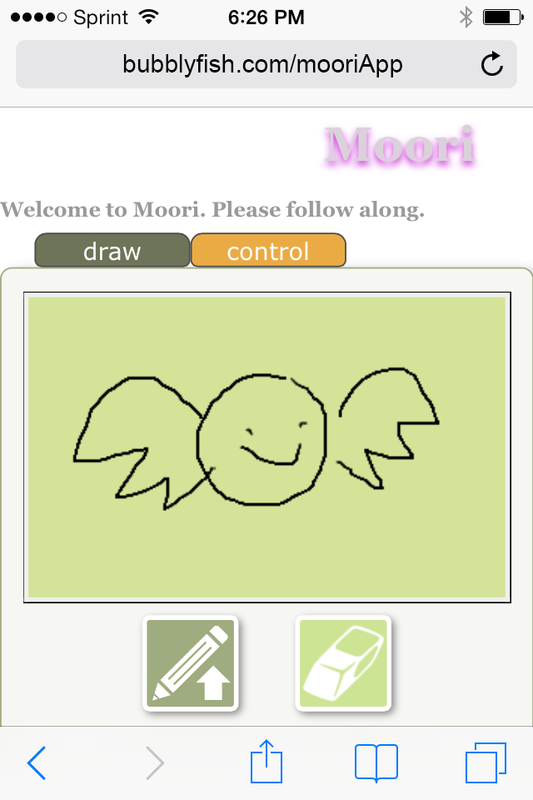 Audience can now interact fully with moori web application. This new version of web app allows users to engage in the narrative, control generative images as mrmr control does. In addition the web app supports drawing feature. With the new drawing feature, users and draw on their web browser and share their drawing on the screen with other participants. The video below is a demo of the application. The screen is recorded with Screenflow demo version. I apologize for the watermark covering up the video window. Moori - visual update 12.14.2012 from Moori on Vimeo. This improvement and modification were made in collaboration with myself and Claire Kwong at Harvestworks. In this update focuses on the display of incoming text data. 1.The movement of user submitted texts is grouped as a movement of words as supposed to the previous version of the character based interaction. 2. When a user submits a sentence, words display in circular shape. 3. When an user submitted answer is associated to a proposed question, texts are connected to the question with lines. 4.Each incoming text messages is displayed in separate colors to distinguish different users. 5. When an incoming text length exceeds the size of the window, the characters wraps around the next line.